Melissa Lamie enters her 20th season as Grove City College's women's soccer head coach. Since taking over prior to the 1993 season, Lamie has directed Grove City to 201 victories, five Presidents' Athletic Conference championships and two invitations to the NCAA Division III Championship Tournament. In 2007, Lamie directed Grove City to a school-record 16 wins and the top seed in the Eastern College Athletic Conference Southern Championship Tournament. Two years ago, Grove City posted its ninth double-digit victory total in the last 11 years by going 12-7-2 overall. The Wolverines advanced to the semifinals of the Eastern College Athletic Conference Southern Championship Tournament. Grove City gave Lamie her 200th victory as women's soccer coach when the Wolverines downed Saint Vincent October 26, 2011. In 2009, Lamie earned PAC Coach of the Year recognition after guiding the Wolverines to a 7-0 conference record and a berth in the ECAC Tournament. She owns a 201-143-27 (.578) career record in 19 seasons as head coach. Under Lamie's guidance, Grove City became the first PAC women's soccer team to go 10-0 against conference opponents during the 2003 season. The Wolverines capped the year by earning their second consecutive berth in the NCAA Division III Tournament with a 16-4-1 record. In 2004, Grove City went 14-6-2 and won the PAC's regular season title with a 9-1 record. Lamie earned the conference's Coach of the Year award following the season for her efforts. Over the past 11 seasons, Grove City has compiled an 81-16-5 record against conference opponents, including four undefeated seasons (2000, 2001, 2003 and 2009). From 2000 to 2004, the Wolverines recorded 69 total victories. In 2000, Grove City earned its first-ever postseason invitation by qualifying for the ECAC Mid-Atlantic Championship Tournament. Two years later, the Wolverines earned the program's first-ever NCAA Division III Tournament berth. In both 2002 and 2003, former standout Meg Tilley received CoSIDA Academic All-America honors. In 2009, six Grove City players achieved CoSIDA Academic All-District honors. A native of Denver, Lamie earned a bachelor of arts degree in physical education from Calvin College in Grand Rapids, Mich. in 1992. In 1993, she completed her master of arts degree in physical education from Northern Colorado University. Lamie is also Grove City's head men's and women's golf coach. 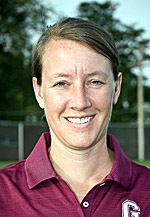 In April 2011, she directed Grove City's women's golf team to its first conference title since 2003. She also coached the women's basketball team at Grove City from 1992 to 2006 and is that program's all-time wins leader with 157. She lives in Pine Township with her husband Steve, the College's head men's basketball coach, and their three children: Melia, 12, and twins Caleb Michael and Rayna Joy, 2.